This recipe is from My New Roots and was a fun was to use our beautiful rainbow carrots that I found at the local market. Everyone enjoyed these including, and perhaps especially, the adorable 1-year old that lives just across from us. While this made a surplus of dressing, my mother pointed out that it would be nice on a good piece of halibut as well, something to try another day perhaps. 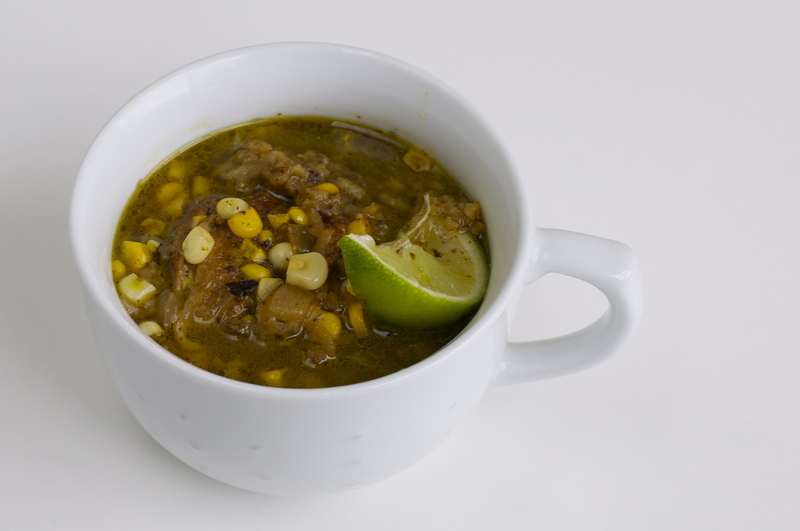 The recipe is very easy to throw together and I hope you enjoy it as much as we all did! Whisk all marinade ingredients together. 1. Whisk all ingredients together. Store leftovers in a glass jar in the fridge for up to a week. Prep carrots by removing the tops (if they have them), and giving them a good scrub to remove any dirt (don’t peel them) . Cut into quarters lengthwise if the carrots are large. Place carrots in the bowl with the marinade and toss to coat. 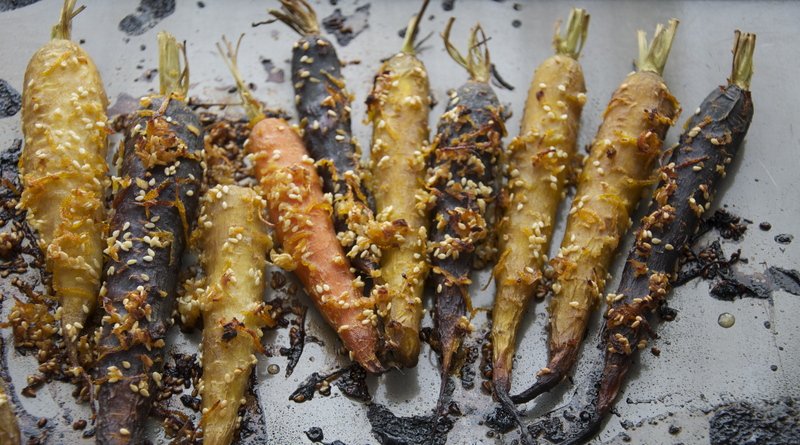 Pour carrots and marinade out onto a baking sheet, sprinkle with sesame seeds, and place into preheated oven. Roast for 15 minutes or so, just until the raw edge is taken off. Keep a close eye on them – do not overcook. While the carrots are roasting, make the Miso Dressing. 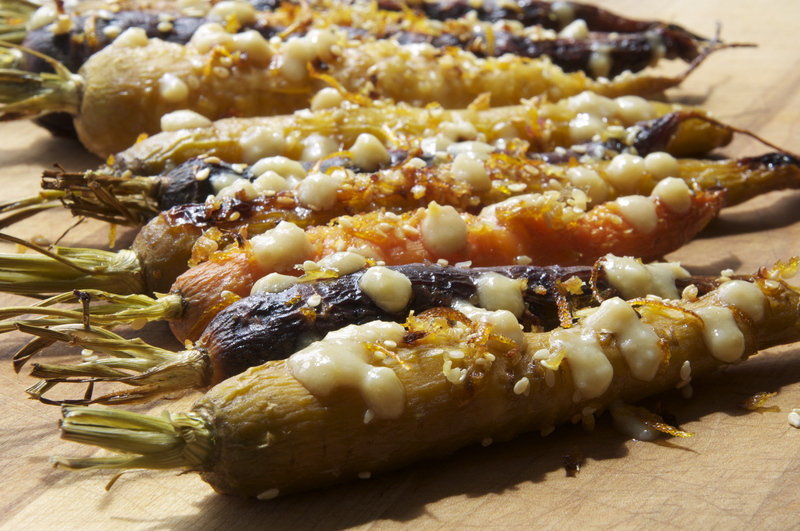 Remove carrots from oven, plate them, drizzling with the dressing. 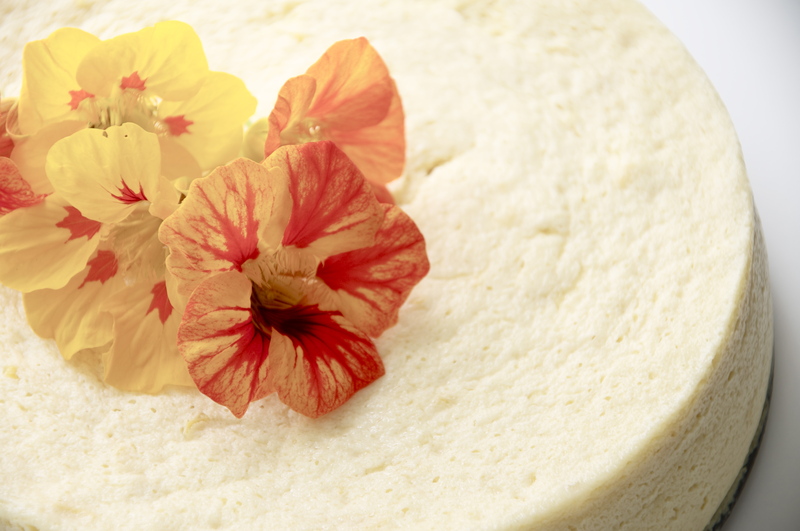 This recipe is one I’ve been dying to try from Cannelle et Vanille. 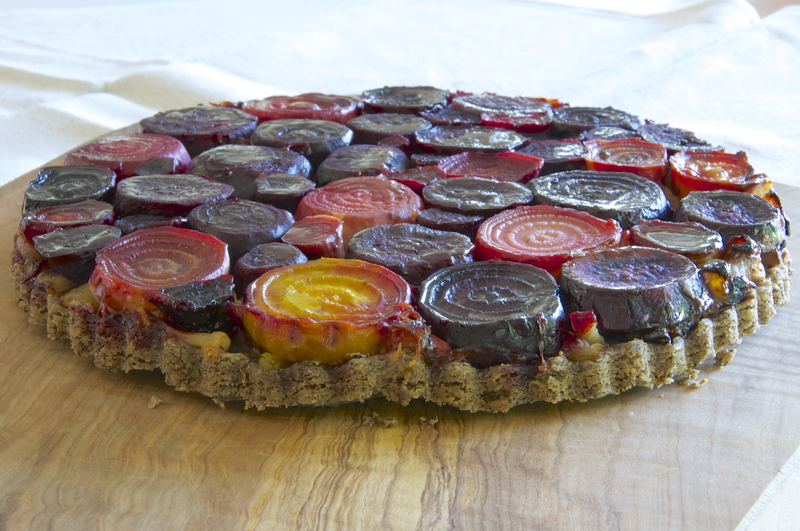 I adapted it a bit: doubled the recipe to make a larger tart and used purple sweet potatoes as opposed to potatoes. 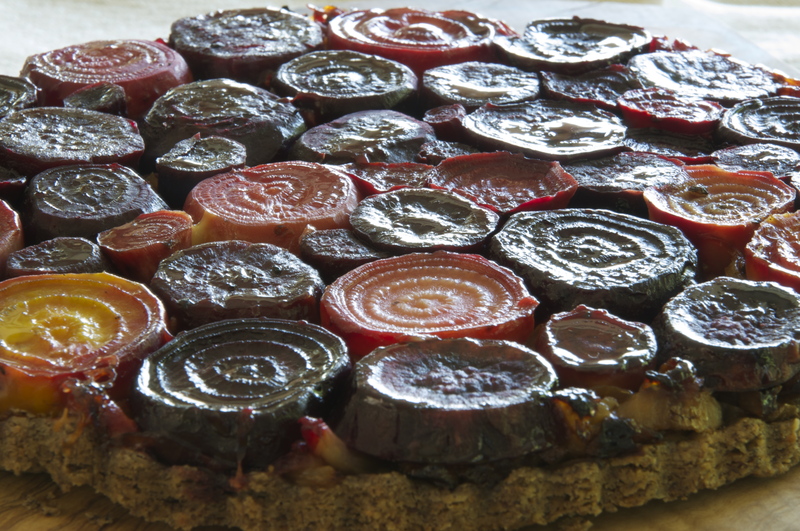 The result was a healthy, savoury tart with the perfect amount of caramelization to appeal to my sweet tooth. The process was a little time consuming but it made for a fun and tasty side to our dinner steaks. Combine the dry ingredients in a food processor. Pulse to combine. Add the diced butter and pulse until the butter is the size of peas. Add the water and pulse until dough comes together. It will not form a ball. Simply press it between your fingers to see if it holds. Transfer dough to flat surface and knead a couple of times. Form into a disk, wrap in plastic wrap, flatten it with your hands, and refrigerate for one hour. Preheat oven to 400F. 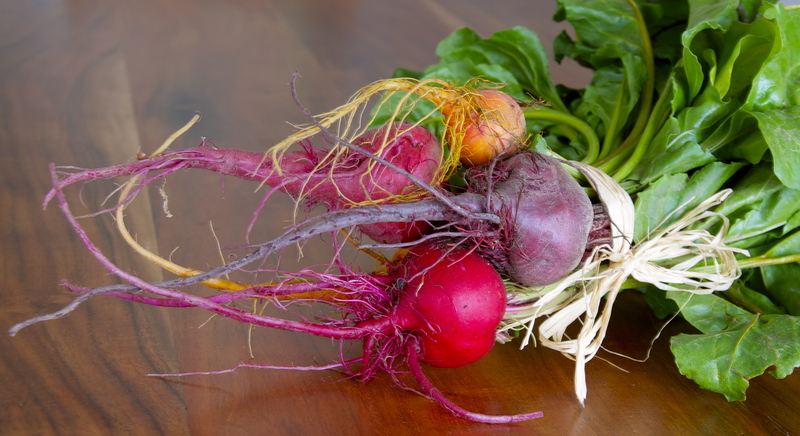 Toss the slices beets and purple potatoes with 1 tablespoon of olive oil, pinch salt and black pepper. Bake the vegetables for 30 minutes until potatoes are done (they take less time than beets) and remove them. Continue to bake the beets for a few more minutes until tender, about 10 more minutes. Set aside and cool while making filling. 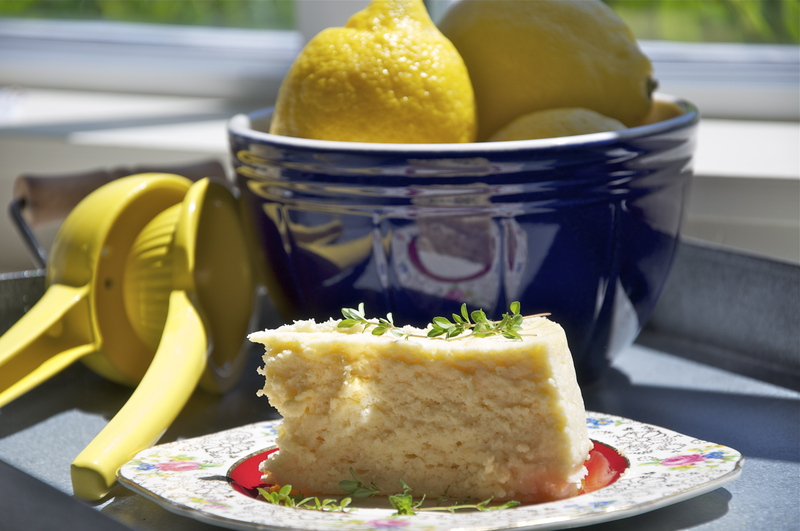 Remove the tart crust from the refrigerator. Lightly dock it with a fork. Dust your cold surface with a bit of superfine brown rice flour. Roll the dough to 1/4-inch thickness and cut a circle that is slightly bigger than your mold. The scraps can be saved for another time. Transfer the tart base to a sheet lined with parchment and refrigerate the tart base for 30 minutes. Heat a medium saute pan over medium heat. Add the rest of the olive oil and cook the onions, fennel, garlic, and a pinch of salt until tender and slightly caramelized, about 10 minutes. Add the balsamic vinegar, stir, and remove from heat. Set aside and let cool slightly. Remove the tart crust from the refrigerator. Lightly dock it with a fork. Place the roasted vegetables inside the tart mold tightly packed. Spread the caramelized onion and fennel mixture on top and sprinkle the Gruyere on top of that. Place the tart dough on top and tuck it into the edges. Bake the tart for 30 minutes until crust is golden brown. Remove from oven and let cool for 5 minutes before inverting onto a plate. Serve warm or at room temperature.